1. Be aware of your posture when walking and standing. Try and 'Feel' tall while dropping your shoulders and keeping your chest open and body long. 2. Use a Physio ball (fit ball) and start to sit on for 5-10 minutes daily. Incorporate it while watching TV or at the computer. 3. 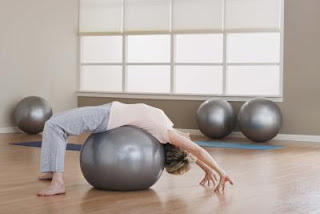 Postural exercises on the Physio ball such as ball rotations are excellent. With a straight back, kneel in front of the ball and place hands on the ball. Turn the abs on (engage them) which creates a stable centre of gravity at the core of the body; gently roll the ball forward. Repeat 10 times. 4. Build muscle development with simple anti-gravity exercises such as lunges, squats and calf raises. 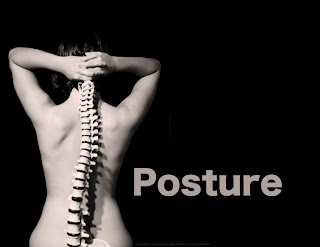 These will all enhance your dynamic posture. 5. Contract the core muscles regularly throughout the day. Practice strong contractions of the pelvic floor, abs and lower back. This helps to give better control of your spine which forms the foundation for great posture. So stand tall and proud ~ and get busy with all those strength building activities.. bike riding, hiking, rock climbing. Make it fun, it doesn't have to take place in a gym or at home.